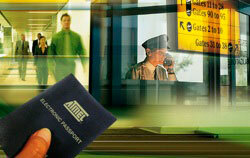 As the pressure heats up to ready for the new generation of electronic passports and secure credentials, Atmel announces a new chip intended to meet the emerging need. The dual interface chip complies with the International Civil Aviation Organization (ICAO) specs for international passports with contactless interface and biometrics. The chip is scheduled to be ready for bulk production by the beginning of 2005. SAN JOSE, Calif., Aug. 10 /PRNewswire/ – Atmel(R) Corporation (Nasdaq: ATML) is proud to announce the introduction of its new AT90SC12872RCFT dual interface secure microcontroller specifically tailored to efficiently serve the electronic identity markets. Applications such as e-passport or e-ID card are taking off today, and Atmel’s AT90SC12872RCFT offers the industry’s best features to make this takeoff faster and easier. The AT90SC12872RCFT complies with the new International Civil Aviation Organization (ICAO) specifications for e-passports. With this secure microcontroller embedded in a page or the cover of the e-passport, the owner’s personal information, such as biometrics data, will be securely processed and stored. Communication with such a machine-readable passport during border controls will be contactless according to ISO/IEC 14443 standard. Atmel’s AT90SC12872RCFT contact/contactless secure microcontroller features 72 KBytes of tamper-resistant non-volatile EEPROM memory to store identity data. Part of this memory can also be used to store applets, leaving more than 64 KBytes for the data. This makes the AT90SC12872RCFT particularly suitable for Java Card flexible operating systems. This chip also features 128 KBytes of ROM program memory and 5 Kbytes of RAM. It shares the same common features of Atmel’s secureAVR(TM) family including its outstanding 8-bit/16- bit RISC core, strong security mechanisms, a power-analysis attack resistant DES/TripleDES engine as well as Atmel’s new AdvX(TM) crypto accelerator for an optimized trade-off between performance and power consumption. The AT90SC12872RCFT is a dual interface contact (ISO7816) and contactless (ISO14443) smartcard chip: the communication mode can be selected according to the application or the chip life phase. During initial data entry, the contact interface may be conveniently used; later during I.D. checking activities the contactless interface will typically be used. Many of Atmel’s secure microcontrollers based on this secureAVR(TM) architecture have already been granted security certifications according to such testing as FIPS 140-2, VISA Level 3, MasterCard CAST and Common Criteria certification to EAL4+ augmented to AVA-VLA.4. This vulnerability assessment corresponds to today’s highest known proven resistance against any security attack. Atmel’s long experience and industry leading position as a maker of extremely dense and robust EEPROM memories and reliable secure microcontrollers is a key advantage when it comes to very long lifetime applications, such as e-passport, requiring up to 10 years or more of 100% error-free behavior. For more information on the secureAVR(TM) product family, please visit Atmel’s website at: http://www.atmel.com/products/SecureAVR.